I have been working on my spindle. It's just a dowel with a large glass bead on it (low whorl). Version 1 had a notch cut into the top, like the Oseberg spindle, and that worked if I wanted to do a half-hitch. But I'm intrigued by all the medieval spindles that are just long and pointy at the top - no notch, no obvious place to secure a half-hitch. I went back to 15th Century Spinning and worked a bit more at trying to copy her technique. I think I get it - you loosely hold the spindle between middle and ring finger, while thumb and pointer finger spin it. Now the need for a tapered top becomes clear, as the 0.25" dowel did not want to spin easily between my fingers. I whittled it down and did a little supported spinning - I will need practice before I can spin it between my fingers but not drop it. Breaking. This was the first demonstrated step. The breaker is a wooden gizmo about waist height, hinged at one end. The colonial-garbed docent first crushed the flax stalks between two flat surfaces at the open end of the breaker to crack the outer material. He said some people skip that step, but he thinks it's effective. Then, he laid the flax stalks across the "teeth" of the breaker and slammed the handle down. Lift, pull the flax a little towards himself, slam. Lift, pull, slam. Lift, pull, slam. Then he turned the bundle of flax around so he could smash the ends he'd been holding. Breaking results in exposed flax fibers and a bunch of crunchy stalk bits. The scutching board is next - a flat, vertical wooden board. Hold the flax against the board and use a dull wooden scutching knife to scrape down, removing the worst of the crunchy stalk bits. Finally, the hackle. It's like a big toothy dog brush. The docent liked to lay the flax through the teeth at about a 45 degree angle, but then pulled straight back towards himself, so that the fibers pulled more strongly against the teeth. Just as you would do for long hair, he did the tips, then a little up from the tips, the half the bundle, and so on. The short flax fibers and crunchy bits caught in the hackle are what he said are "tow," lower-quality flax that can be spun for lower-quality linen. In his hand was the long-staple flax for making good linen. And I got to take the flax home! Only weird bit - the docent told me that linseed oil was toxic, so you had to be careful with the retting water and handling the linen itself. Now, it does not surprise me that water which has had plants rotting in it isn't healthful to drink, but I thought traditional spinners often ran the flax over their lips to wet it? Well yes, perhaps, said the docent, but it isn't good for you. After I left, I remembered that oil-rich flax seeds are sold as a health food. So I did some Googling. Linseed oil is perfectly safe in normal doses. Yeah, if you take a megadose of supplements, it can have some bad side effects, like doing straight shots of oil tends to have on a body! The museum oddly does not have an email contact address, so I think I will write them a short note thanking them for the experience (it's a really cool museum and re-construction!) but also pointing out that maybe they should double-check that part of the docent script. I'm teaching two classes, the notes for which I'll post soon: A Guided Tour of Medieval and Renaissance Music, and Early Period Music Theory. The Guided Tour has holes in it, as any attempt to summarize all of music across our period would. I grabbed a lot of my favorites, pieces with melodies congenial to the modern ear, and most with pleasing accompaniment. The class notes have a discography as well as links to YouTube videos (posted by artists) with the same or similar music for those playing along at home. Bonus: I have a sweet medieval mix CD for the car. Every time I think I've got medieval music theory down pretty well, I learn that nope, there's some subtlety I got wrong. This iteration of the class is much better than the previous one. Or will be - I still have to gut and redo the section on organum. But it's almost ready to go. I am becoming convinced that the Beka loom is a toy, not because of its small size or rigid heddle, but because its tensioning system is crap. On the plus side, I have been learning the importance of consistent warp tension, and what variation in tension does to woven fabric. I wove a small tapestry on Saturday, having almost no idea what I was doing. I wound pearl cotton thread around a small (5" x 7") wooden picture frame as snugly as I could, but tying it off was hard. The last few warp threads were more slack that I'd have liked. Then I used my bone folder (from book-binding) as a pick-up stick/shed-making device, and started passing various colored yarns through. I thought I'd seen looms set up with two shed sticks in the warp so you didn't have to pick the warp up every time, but I couldn't figure out how to get that to work. But on a piece of this tiny size, re-doing the shed each time wasn't so bad. In some places, it was easier to use a tapestry needle to just sew the thread around the warps. When not using a needle, I bundled the yarn into tiny butterflies - but I think bobbins will be an early upgrade purchase. Towards the end, the shed got smaller and smaller. Eventually, I (carefully) slid the work down around the bottom of the frame, to get more empty warp up top. That helped. I used one of the women/valkyries in the Oseberg tapestry as my cartoon. I couldn't figure out the soumak technique to do the outlining and just went with color blocks. It looks... about like you'd expect a first attempt to look, but it isn't entirely unrecognizable. It was fun! It seems kind of odd, now that I think about it, that I haven't seen much tapestry weaving in the SCA at all. I can't go to Novice this weekend, but I want to display my string stuff. So I safety pinned my first weaving, naalbinding, and tapestry to a tea towel and slapped on some labels. If I can get someone from SENEA to take it and set it out, it's an all-in-one A&S display. When I started this blog in 2008, it was far and away focused on music and poetry. What work I did on other arts (e.g., for KASF 2009) I posted to my LiveJournal. I eventually decided that was a silly and artifical split. This blog is 99% for me - it's not like I have an actual large audience, waiting for irregular posts on amateur early music interpretation. Nobody was there to complain if I started including other projects, so I did, under the new organizational category "Sideline Research." That's worked well, but doesn't work well any longer. I feel that I'm doing enough, on a variety of projects, to start breaking them down. I've added Accessories, Calligraphy and Illumination, Clothing, Embroidery, Gear (camping gear, feast gear, etc. ), Tablet-Weaving and Weaving. That covers most of what I've been up to; I should think about some "other" category. I've also added "Loot," as a place to blog about things I've bought or otherwise acquired, rather than made. I'm slowly working my way backwards through the old Sideline Research posts and re-categorizing them. When I've completed it, I'll remove the Sideline Research category. I managed to volunteer for a retreat at church which is the same day as KASF. Guess I don't have to worry about Pentathalon this year. I discovered FabicMart.com. They were having a super-sale on wool suiting, and I scored some lightweight "cornsilk"-colored herringbone twill. I thought it was a solid, but as it arrived today, I see that the warp and weft are different colors (white and 'cornsilk'). I keep putting 'cornsilk' in quotes because it looked like a warm butter yellow online, but is really a cool, almost greyish light yellow. Still, it's fine. I have 3 yards of 61" wide fabric. Some of it is destined for a new version of my Harley Psalter bag. I'm trying laid and couched work in a wool version of the battle flag. Not sure I'm getting it right - do the laid threads go all the way across? I'm getting confused between what I'm seeing online and what I vaguely remember Mistress Aenor showing me, in between classes at a University, like four years ago. I will ask Baroness Janina, next I see her. I found Heroic Age, a peer-reviewed free online journal specializing in early northwestern European studies. Since the Early Northern European Working Group starts meeting this month, this is a happy coincidence. ...as much as the "new things" are very shiny, I think I need to address the open projects first. It's a lot of admin stuff, but I keep putting it off so it never gets done. It's that time again! And KASF is really nearby. I want to do something. 6th or 7th cen. Kentish, I think. Kentish robe - that I've been wanting to make anyway. Kentish gold-brocaded headband - ditto. 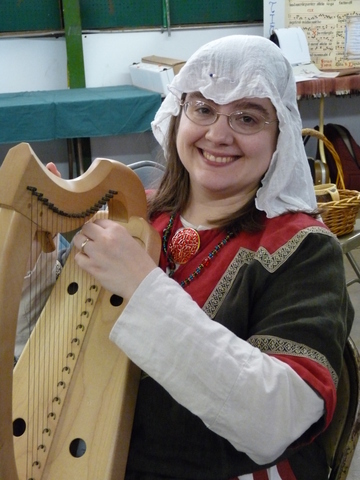 Guthrun performance - okay, this is a stretch to the 6th cen, but any performance would be. A book? Calligraphy in the book? Or embroidery on the robe. Or that crystal ball, but that's hardly worth an entry. The joined pin suite? Very modern materials. Get together a program of performance suitable for next Pennsic's Performing Arts schedule. Begin podcasting or YouTubing various useful things. I don't even know where to start prioritizing. I want to get back to performance... I want to provide a needed resource to the lyre community. The temptation is to create an uber-project that addresses all these thing - perhaps a web-based Lyre Handbook that includes embedded YouTube videos of performances? That gets at all of these goals, but necessarily means progress on all of them will be slower than if I concentrated on them specifically. On the other hand, something like YouTube that allows one to show rather than just tell about instrument playing techniques is a huge advantage that should be considered.